OSPF is used in numerous networks, it is well documented, well-known and widely tested in many scenarios. When IPv6 came along, good old OSPF which was used for IPv4 (OSPFv2), got a younger brother – OSPFv3. Many networks now run both protocols, one for IPv4 and the other for IPv6. This is getting more and more ridiculous, because OSPFv3 can be used to route IPv4 also. The default route is the path toward all those networks which have no other matching routes defined. What a boring definition :-(. Let me try again: “The default route will take you to the unexplored areas of the divine Internet!”, or: “Follow the default route to eternity!”. Back to earth, ::/0 represents everything out there (except for the historic IPv4 stuff). Where does the route for ::/0 come from? Multiple OSPF processes with mixed network statements can really mess things up! Fortunately, there is a better way to assign an interface into an OSPF area. 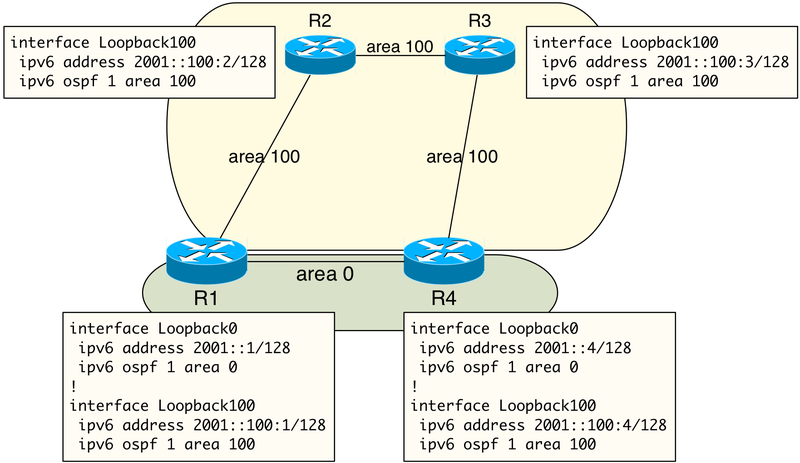 …enables OSPF process on the interface Vlan100 and assigns that interface to OSPF area 1. Most things in networking are not revolutionary. No need to reinvent the wheel. After many years of continuous growth of your backbone network, you might decide to clean up the mess and renumber the network within one single IP prefix covering the whole area. If OSPF is your choice for the interior routing protocol for IPv4, this is the right time to think again about using the OSPF network statements. A single network statement per router is all you need to make all the backbone interfaces seen by the OSPF process. Will it work or will it cause conflict with the “network 10.0.0.0 0.255.255.255 area 0” statement? Od presenečenja, da se oprema nekega proizvajalca obnaša drugače kot oprema drugega, je do brskanja po RFC-jih le še korak. V testnem okolju sem na sosednjem usmerjevalniku (router2) nastavil pot do nekega ciljnega IP-naslova tako, da ja ta pot kazala nazaj proti mojemu usmerjevalniku (router1). Presenetilo me je, da moj usmerjevalnik te poti ni prepoznal kot veljavne in je ni vpisal v svojo usmerjevalno tabelo. Naslov OSPF Forward Address za to pot, ki ga je izvedel od soseda, je bil namreč on sam. Zato je razumljivo, da je bila zanj ta pot neveljavna. Ker se mi zdelo nelogično, da nek usmerjevalnik nastavi Forward Address na nekaj “povsem neuporabnega”, sem najprej preveril, ali enako velja tudi za kakšno drugo vrsto usmerjevalnikov. Na usmerjevalnik router1 sem zato na enak način povezal še usmerjevalnik drugega proizvajalca (router71).